Can you see the icons and text on your screen crystal clear? If you can’t you probably need to adjust your screen resolution. But what exactly is the meaning of your screen’s resolution? Screen resolution refers to the number of pixels your screen can show both horizontally and vertically in a frame. If your screen has more pixels, you’ll have a sharper image; but consequently, various on-screen elements like text and icons will decrease in size in order to accommodate more elements to get fitted. Conversely, having a lower screen resolution will mean lesser pixels laid out horizontally and vertically, blurry pixelated visuals and more elements that fit onto a computer screen. The real question is, does and unbalanced screen resolution affect PC usage and how can one change the resolution? Ideally, what you’d want is to have a balanced screen resolution where there isn’t a lot of stress on your eyes and the screen vision is also crystal clear. Balanced screen resolutions also therefore affect your productivity. Different users may have different screen resolution preferences though. It’s really a matter of what you’re comfortable with. 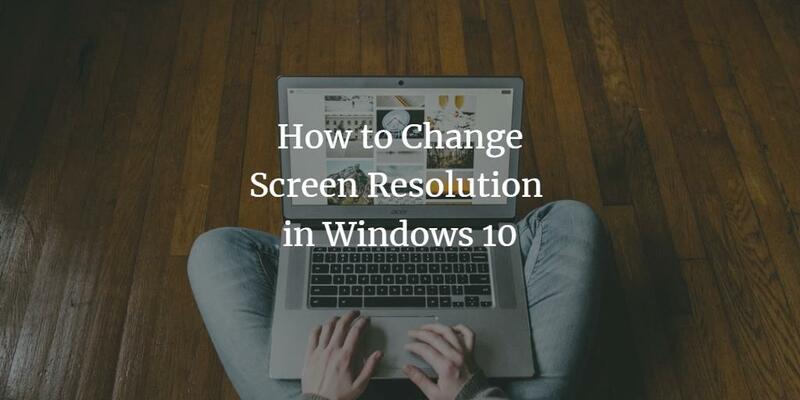 In this article, you’ll find out where you can change your screen resolution settings in Windows 10 and how you can change them according to your own preference. Step 1: Go to your Desktop and right click on the empty area on the screen. Step 2: From the pop-up menu, select Display Settings. Step 3: A new Display Settings window will pop up where you can find the Resolution section. If your screen doesn’t show the resolution settings directly, simply click on advanced display settings and you’ll find it there. Click on the drop-down list to browse through different resolutions. Step 4: Select the screen resolution you prefer or you can even opt for the resolution Microsoft recommends and click on Apply. Step 5: You’ll then be prompted to save your screen resolution settings within 15 seconds if you’re happy with them. You can also opt to revert back to the previous screen resolution if you’re not satisfied with the new settings. Voila! Wasn’t that easy? You’ve successfully learned how to choose the right screen resolution settings for yourself. In fact, you can even change your display and screen resolution settings from your Settings app in the Start menu. Both low and high resolutions have their pros and cons. Most users don’t like their screens crammed up with blurry visuals. If you also like clear and sharp visuals and don’t have an issue with a balanced number of elements being shown on your screen, we suggest you use higher resolutions. But if things get a little too sharp for you, you can always revert back to your old resolution settings.